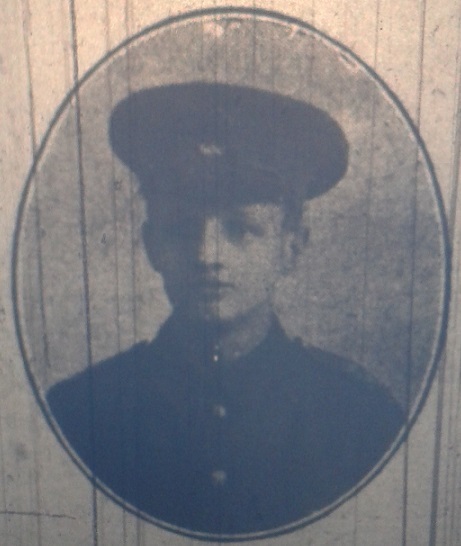 Private William Farmer (b. around 1890) was the son of Isaac Farmer of South Ranceby Grantham. William lived at Kiveton Park Station and was a labourer. 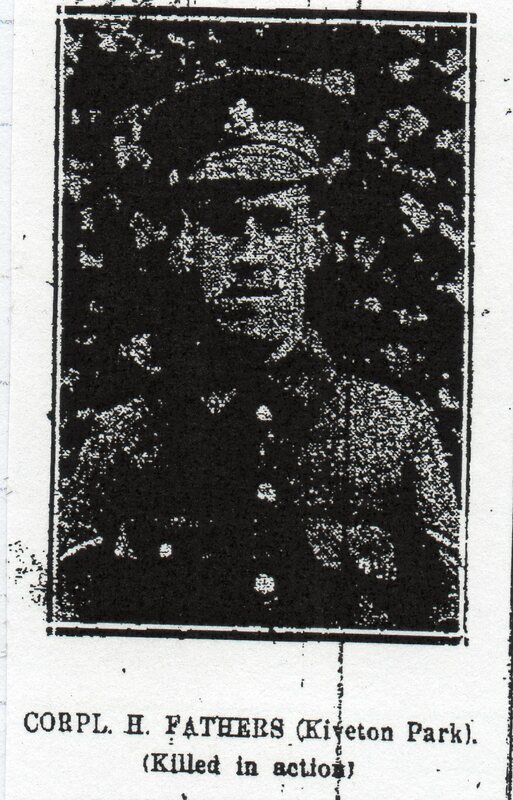 He enlisted 12th February 1916 at Pontefract into Yorks and Lancs but was put in the reserves. He was later called up in 1917 and served with 494 Agricultural company Labour Corps (service numbers 130520; ? ?547; 495142). He was discharged 24th February 1919. Corporal Harry Fathers was born 1885 at Kiveton, the son of Elizabeth Fathers who had been widowed and lived at 17 Wales Road, Kiveton. He enlisted along with many others from Kiveton and surrounding areas on 2nd September 1914 at the St John’s rooms, Kiveton, joining the Notts and Derbys Regiment (Sherwood Foresters) 17th Battalion (service number 14761). Prior to enlistment he worked at Kiveton Park Colliery and played football for Kiveton. He was killed on 5th June 1917 and is buried Metz-en-courture Communal British Cem Extension, Calais, plot 1 D8. He is also commemorated on the Wales Square memorial and the Kiveton Park Colliery memorial. Harry’s nephew is local historian Arthur Fitton. 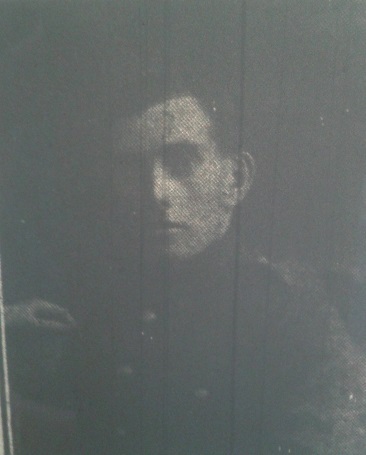 Lance Corporal Albert Fearn (b. 1887, Selston Notts) was married to Annie, they had 2 daughters and lived at 1 The Square, Wales. He worked at Kiveton Park Colliery. He enlisted on 2nd September 1914 in the St John’s rooms at Kiveton, joining the Notts and Derbys, 11th Battalion (service number 14722). He was killed in the great offensive of 1st July 1916 and is commemorated on the Thiepval memorial, the Wales Square memorial, the Kiveton Park Colliey memorial and the St John’s Church plaque. His wife Annie later married a Mr Saxilby and moved to 14 George Street, Waterloo, Sidney, Australia. 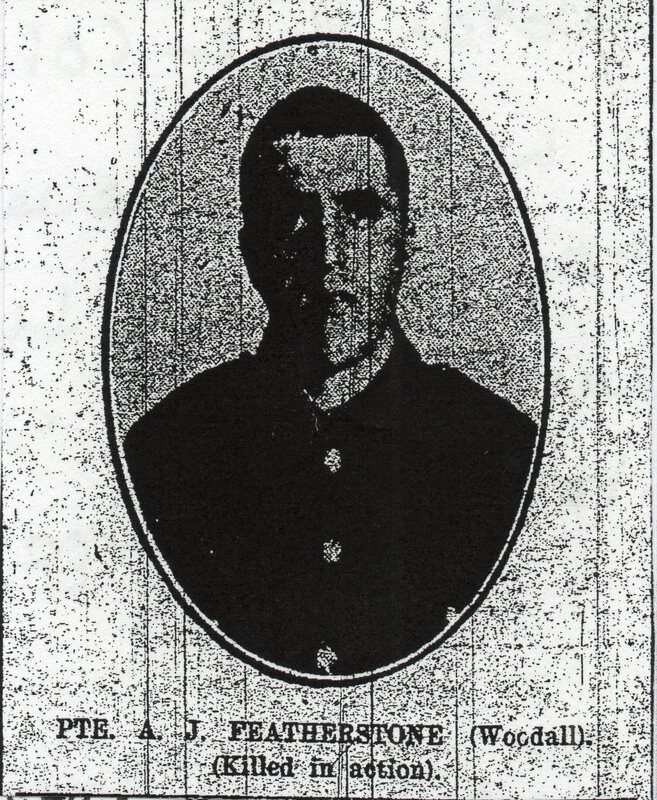 Notification has been received from the War Office by Mrs. A. J. Featherstone of Woodall, that her husband, Private Alan Joseph Featherstone, 10th Battalion, Lancashire Fusiliers, was killed in action on July 14th. Pte. Featherstone had only been in France a fortnight, and he would have attained his 28th birthday, the day following that on which he was killed. He was a native of Laughton and enlisted on January 7th 1915. Previous to enlistment he was employed by the Kiveton Park Collieries. Much Sympathy is expressed with the widow and child. Pte. Edward Froggatt, Yorks and Lancs, brother-in-law of the deceased, was wounded in the great advance, and is in hospital at Westgate-on-Sea. Alan Joseph Featherstone is commemorated on the Thiepval memorial and also the Colliery Memorial at Kiveton. Private Robert Featherstone (born 1894, Harthill) was the son of William and Jane Featherstone and lived with his brother William at Harthill. He worked at Kiveton Park colliery. He served with the York and Lancaster, 9th Battalion (23369) having enlisted on 9th Dec 1915 at Sheffield. 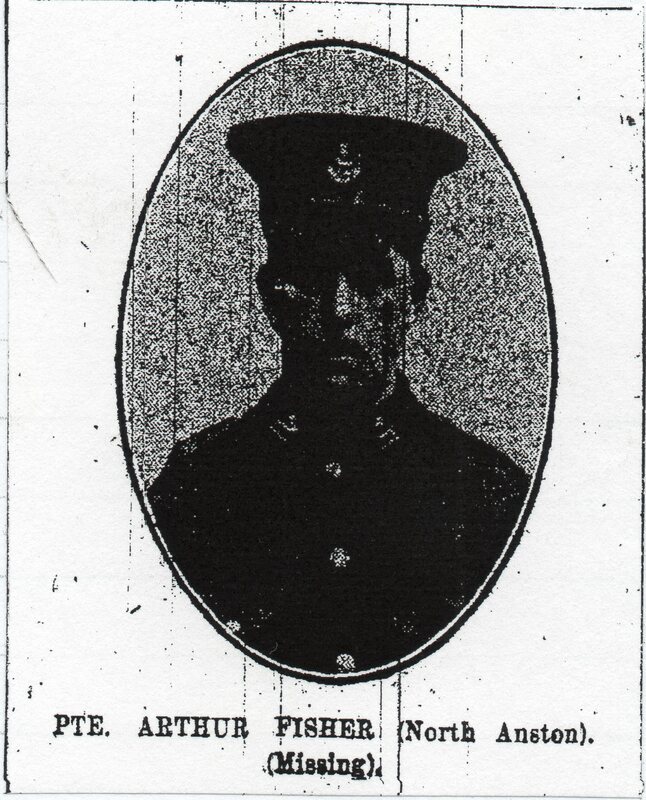 He was reported missing which was reported in the Worksop Guardian on 18th August 1916. As briefly reported in our last issue, Private Robert Featherstone, - 23869- 9th Yorks and Lancs, is reported by the War Office to be missing as from July 20th. He last wrote home on July 18th, saying that he was alright. He had just come out of the trenches for a rest, but expected to be in action very shortly again and two days later he was reported missing. He formerly belonged to the West Ridings but on arriving in France was transferred to the Yorks and Lancs. He had only been in France a month. Since he last wrote home, no news has been received of him other than the War Office notification. It was his custom to write home and to his friends several times a week. Any information is eagerly awaited by his brothers and sisters. It was later confirmed that he had been killed in action on 20th July 1916. He was buried in the Lonsdale Cemetary, Authuille France.Plot VI, H5. He is also commemorated on the Kiveton Park Colliery memorial. The parents of Private Arthur Fisher, Starchhouse Lane, North Anston, have received the news that he is missing after the recent heavy fighting in France. Pte. 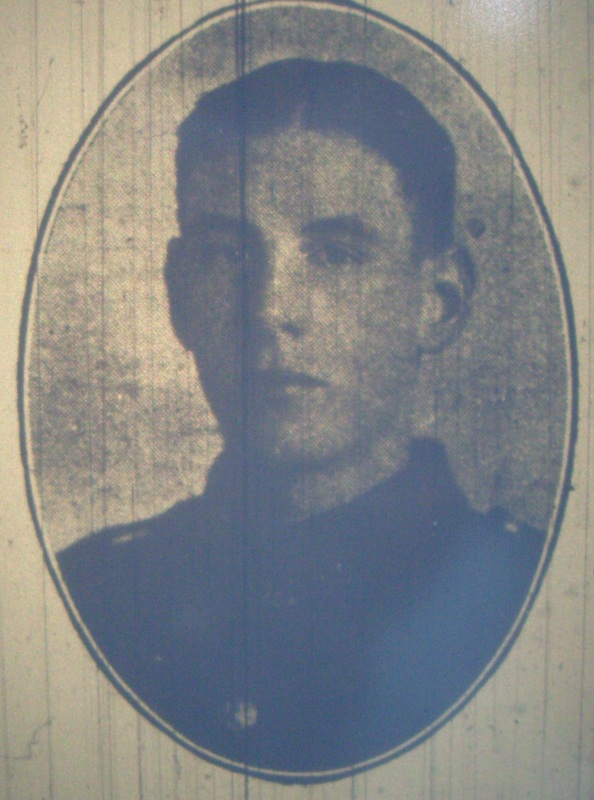 Fisher, who is 23 years of age, enrolled in the Yorks and Lancs with the first batch of “Kitcheners” men from Dinnington Colliery, and has been in France just over a year. Private Harry Fletcher (born around 1893 at Ruskington) was the eldest son of Alexander and Mary Ellen Fletcher, who lived at Ruskington in Lincolnshire. Father Alexander's parents and some of his siblings lived at Kiveton and it appears that Harry and his brother Walter were living in the village while working at Kiveton Park Colliery. He served with the Prince of Wales Own (west Yorkshire Regiment, 1/7th Battalion (48831). The article in the Worksop Guardian confirming his brother Walter's death, stated that he was being held as a prisoner of war. He died shortly before the end of the war on 6th October 1918 and just 3 months after his brother. He is commemorated on the Colliery memorial, but does not appear on the Wales Square memorial. Private Walter Fletcher (born around 1895 Ruskington) was the younger brother to Harry. Walter worked at the Kiveton Park Colliery prior to enlisting into the Grenadier Guards in July 1917 (30446). He married Edith Mayfield-Green in October 1917 in Sowerby Bridge. He was killed in action on 23rd August 1918 and the report in Worksop Guardian of September 27th 1918 quotes the letter his wife received: “It is with feeling of true sympathy, that I write to offer my sincere condolences in the loss of your gallant husband. I am afraid it will prove an almost irreparable loss to you, but I am proud to be able to tell you that he died as he had lived,a gallant man, in action, who put his duty to his King and country before allthought of his own safety”. Pte. Fletcher was killed by a bullet whilst advancing against very heavy machine gun fire. He said the company had lost a first class soldier, and a very good fellow. “He laid down his life whilst helping the battalion to take very important objectives”. Walter is commemorated on the Vis-en-Artois British Cem Panel 3 and also the Wales Square and Colliery memorials. Private Horatio Fretwell was born at Wales in 1884 son of William and Elizabeth Fretwell and brother of George (below). He was married to Ada and worked at Kiveton Park Colliery. He was a reservist (having first enlisted in 1904) and was recalled at the outbreak of the war. He served with KOYLI (8448) and was wounded in December 1914 in battle of Aisne and transferred to a Liverpool Hospital. He was discharged 9th Nov 1917. Private George Marshall Fretwell (b.1896, Wales) son of Mr William and Elizabeth Fretwell of 58 Church Street, Wales. He played football for Wales FC. He enlisted on 15th November 1914 following his brother into KOYLI, serving with 9th Battalion (19883). He was wounded in the offensive of July 1916 and died in hospital on 4th July 1916 from his wounds. A memorial service was held in Wales on 23rd July 1916. He is commemorated on St Sevre memorial, Rouen and also the Kiveton Park Colliery memorial and Wales Square memorial. Private Arthur Froggatt was the son of Tom and Caroline Froggatt, who lived at 21 North Terrace in Waleswood when he died on 18 September 1916, at the age of 23, during the Battle of the Somme. Arthur had grown up in Swallownest, his father a surface-man at the pit. Arthur was a teacher at Wales Council School (now Wales Primary) and also the local Scoutmaster. Arthur served with the 1st/7th Battalion of the West Ridings Regiment, the Duke of Wellingtons, service number 7/5430. He is buried in the Lonsdale Cemetery at Authuile (VIII. F. 5. ), which is approximately five kilometres north from the town of Albert. 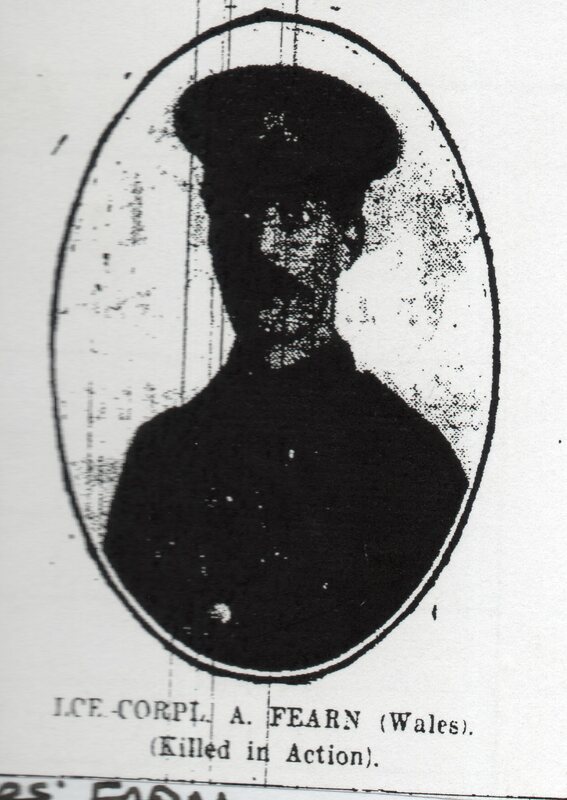 Private Cuthbert Froggatt was the 19-year-old son of Joseph and Ellen Froggatt of 9 Manor Rd., Wales, joining the KOYLI, 8th Battalion, service number 19882, with his friend Fred Whyles. Cuthbert was reported missing following the first day of the Somme offensive 1st July 1916, but it was later confirmed that the two friends had died on the same day. He is remembered on the Thiepval Memorial, Pier and Face 11C and 12A, and also the Colliery memorial. Private Edward Froggatt (b 1895, Waleswood) lived at New Cottages, Woodall. He enlisted 13th April 1916 at Pontefract into York and Lancaster Regiment (25486) and was later attached to 27th Northumberland Fusiliers. He was sent to France 24th July 1916, accidentally wounded on 7th Aug 1916 to forefinger of left hand. He was put on reserve. He married Zilphah Mary Nicholls in 1919 and died in 1943. Mr. Geo. Emmerson, J.P., of Kiveton Park, has received an interesting picture postcard from Driver C. Frost, of the M.T. A.S.C., British Mediterranean Expedition, whose home address is 5 Manor Road, Wales. The postcard has a picture of the Great Pyramid and the Sphinx on it. Driver Frost says they are camping on the sea-shore about eight miles from Alexandria, and he is very fit. He believes they will be moving soon, as they have heard rumours of going to Serbia or Greece. He adds that the heat is intense. Driver Frost also enclosed an interesting description of the journey of his section from London to Devonport for embarkation, but unfortunately it was too long for us to give this week. His service is recorded on the Wales UM chapel plaque. “Dear Mrs. Fry,- It is with the deepest sympathy that I take the opportunity of writing these few sad lines to let you know about the death of your dear son Joseph, who was killed in action on the morning of the 9th. He was killed instantaneously and suffered no pain, and is buried near the spot where he fell. He was a good lad and a good soldier, and will be missed by all the boys in the platoon and section. He was always cheery in his ways and carried out his duty as a soldier to the last moment. I hope God will bless you and your family, who are left to mourn the loss of their loved one. I write this note on behalf of his mates, myself included, as I was his platoon Sergeant. With our heartfelt and deepest sympathy, - Yours sincerely, Serge. J Crosbie”. The news has been confirmed by letter from two of his comrades. Pte. 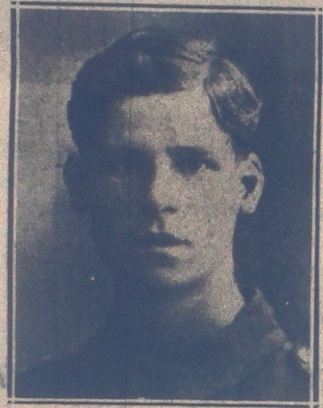 Fry, who would have attained his 20th birthday on November 9th, enlisted on July 30th 1915, and prior to that, was employed at the Kiveton Park Collieries. He was a bright intelligent lad, and was very well liked by all who knew him. Sincere sympathy is extended with Mr. and Mrs. J. Fry and family in their deep sorrow. He is commemorated on the Colliery, Wales Square memorials and St Johns church plaque.